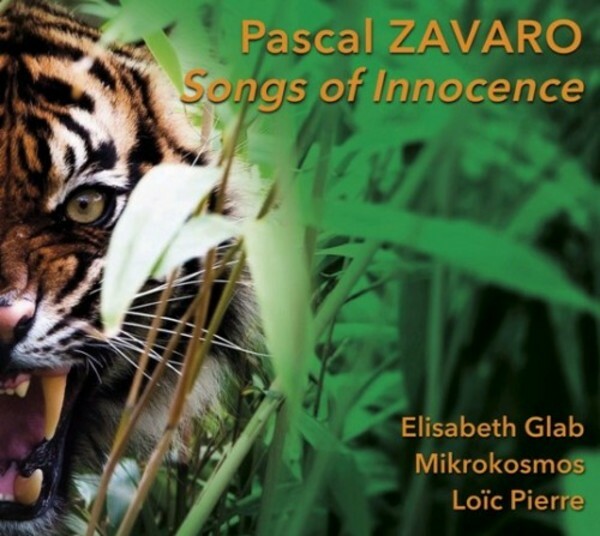 "The program of 'Songs of Innocence' gives an overview of my decade-long relationship with the Ensemble Mikrokosmos and Lo�c Pierre. Each project and each concert of this unique ensemble has been an unpredictable and exalted adventure, fuelled by an incessant creativity. Pascal Zavaro grew up in a milieu of visual artists. After attending the Conservatoire National Sup�rieur de Musique de Paris and the Toho Gakuen School of Music in Tokyo, he completed his studies with Keiko Abe (marimba), Jean-Fran�ois Zygel (counterpoint and orchestration) and Rikako Watanab� (harmony). He has written more than 80 works for solo instruments, chamber groups, and vocal and orchestral ensembles, with certain scores combining electronics with traditional instruments. Rhythmic thinking occupies a central place in the work of this composer who loves to hear in his music �the noise of the world� : Pascal Zavaro has a taste for music with a pulse, a dynamic swaying, a contagious energy that does not hide its influences, from the 16th century madrigalists to the contemporary minimalists. But the array of influences nourishing his work is vast: pictorial affinities crystallized during his infancy and adolescence resurface today, implicitly or otherwise, and structure his works.